On baseball's biggest stage, Chicago Cubs right-hander Claude Passeau tossed the game of his life: a one-hit shutout against the Detroit Tigers in Game Three of the 1945 World Series. Though often overlooked in discussions about the best pitchers of his era, Passeau was a durable workhorse and five- time All-Star who averaged 15 wins and 252 innings over a ten-year stretch (1936-1945) for the perennially underachieving Philadelphia Phillies and Chicago Cubs. Undeterred by the “no prospect” label given to him by Tigers scout Billy Doyle, the 26-year-old Passeau signed with the Des Moines Demons in the Class A Western League for the 1935 season.7 Unexpectedly, Passeau harnessed his speed and developed into the circuit’s best pitcher. He struck 68 batters over a five- game span en route to the league high in strikeouts (239) and wins (20). Passeau got another chance when Pittsburgh Pirates scout Bill Hinchman signed him to a contract in late July. “The Phils young pitching staff should be better,” declared an Associated Press report during spring train- ing in 1937.13 Manager Wilson boasted three prized, strong young arms, Passeau and Bucky Walters, both 28 years old, and 23-year-old Hugh Mulcahy. Phillies hurlers suffered from playing in the Baker Bowl, which was described by New York Times sportswriter Roscoe McGowen as a “hat box ball park.”14 It was a pitcher’s nightmare with its short 280-foot right-field fence, which artificially inflated ERAs. Passeau proved to be one of the most durable pitchers in the league, pacing the senior circuit in innings (2921⁄3) and starts (34), and appearing in a career-high 50 games.Though he yielded a league-high 348 hits, he still managed a 14-18 record for the seventh-place Quakers, as they were colloquially called. Trade rumors swirled constantly around the Phillies’ “Big Three” pitching core, but financially strapped team owner Gerald Nugent, long renowned for selling his most talented players, rejected all offers — until he needed the money. Passeau’s stock in trade was a high, sailing heater, a curveball, and a change-of pace. According to The Sporting News, he was able to make his fastball sail by placing his index and middle fingers against the seams and folding back the knuckle of his ring finger to grip the ball. The movement of the ball was described as “strangely mystifying” and resembling a spitter.15 “I have a great habit of blowing in my hands when I get ready to deliver the ball,” said Passeau. “And because the ball does sail, the batters think I am doing something illegal.”16 Opposing managers routinely requested that the home-plate umpire examine balls thrown by Passeau, as well as his cap and glove. Passeau was also accused of throwing a “sweat spitter.”17“Lots of times I would get in a jam and I might have a scuffed ball. I’d throw it out and get a new one because a smooth one would sail better,” said Passeau. “That’s a reason why umpires used to check me so often. They thought I cheated because the ball would kind of knuckle up there.”18 Passeau forged a psychological edge with his dastardly pitch. He was fidgety on the mound, and consciously tugged at his cap and pants, and altered his glove to give the impression that he was doing something illegal. Even though no incriminating evidence was ever found on Passeau during a game, the charges of throwing a spitball continued until his retirement. Passeau endured a nightmarish season in 1938 as the Phillies won only 45 times. On a woefully inept staff that lost Walters to the Cincinnati Reds at the trading deadline, the overworked Passeau suffered from the strains of starting and relieving. 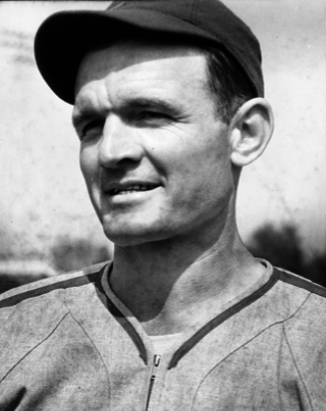 (From 1936 through 1938 he appeared in 143 games, more than any other pitcher in the NL.) Passeau finished with an unsightly 11-18 record, but three of the wins occurred during a dominating ten-day stretch in July. Passeau made a “‘declaration of independence’ at being released from the telephone-booth proportions of the Baker Bowl,” wrote the AP’s Sid Feder cleverly with a nod to American history about the big right-hander’s five-hit victory over the Boston Bees on July 1.19 [The Phillies had ended their tenure at Baker Bowl on June 30 and started playing their home games at Shibe Park, the Athletics’ ballpark.] Following a second complete-game victory over the Bees, on July 4 in the City of Brotherly Love, Passeau tossed a career-long 16-inning complete game to defeat the Brooklyn Robins 4-3 in front of just 1,277 spectators at Shibe Park. A .500 team at the time of the trade, the reigning NL pennant winners were hard pressed for quality pitchers with only Bill Lee and Larry French as reliable starters. Edward Burns of the Chicago Daily Tribune championed the acquisition of Passeau, whom he described as “one of the league’s better right hand pitchers” despite a 38-56 career record.21 In his first start with the North Siders, Passeau limited the Dodgers to just four hits and struck out seven in seven innings in a 3-2, 14-inning loss. He gave the Cubs a much needed shot in the (pitching) arm and proved to be the team’s most durable and effective hurler, capable of starting and relieving. The Cubs moved to within 61⁄2 games of the league lead behind Passeau’s complete-game victory over the Cincinnati Reds on September 2, but finished the season in fourth place. At the age of 30, Passeau enjoyed his first winning season (15-13) and led the National League in strikeouts (137). The rubber-armed Passeau was manager Gabby Hartnett’s jack-of-all-trades in 1940. He appeared in 46 games (third-most in the league), completed 20 of 31 starts, and won 20 games for the first and only time in his career. In a 12-day stretch in August he won five consecutive games, including two shutouts. Notwithstanding his success, Cubs beat reporter Irving Vaughan opined that Passeau “can rightly claim that he and lady luck are almost total strangers.”26 Passeau suffered from the league’s second worst defense (in terms of fielding percentage) and a notably inconsistent offense (they scored three runs or fewer in ten of his 13 losses). As the Cubs fell on hard times after 14 consecutive winning seasons (1926-1939), Passeau became one of the team’s enforcers. He had a penchant for throwing inside, regularly dusting off batters, and worked quickly (complete-game victories under two hours were de rigueur). The Sporting News asserted that Passeau’s “temper make[s] many of the game’s best hitters duck in terror of his high hard one.”27 Although he paced the circuit in hit batsmen just once (1938), Passeau was one of the instigators in the team’s beanball wars with the Dodgers in the early 1940s. In a highly publicized event on July 19, 1940, at Wrigley Field, Passeau flung his bat at pitcher Hugh Casey of the Dodgers after being dusted off twice and then hit in the back by a pitch in the eighth inning. That precipitated a bench- clearing brawl. Rumors later surfaced that Dodgers manager Leo Durocher had ordered Casey to plunk Passeau. Passeau was named to the first of five All-Star squads in 1941 and was involved in one of the midsummer classic’s greatest moments. Just two days before the All-Star Game, he tossed a complete game on two days’ rest and arrived in Detroit feeling the effects of over- work. Passeau entered the game in the seventh inning. With two outs and two men on in the ninth, Ted Williams victimized Passeau by launching a dramatic walk-off home run at Briggs Stadium to give the AL an exciting 7-5 victory. While in 1942 the Cubs sank to depths not experi- enced in 17 years Passeau was recognized as one of the National League’s best pitchers. “It’s a pity Claude Passeau is working for a club so lowly as the Cubs,” wrote Joe King of the New York World-Telegram. “For service to his team Passeau isn’t surpassed by anyone — he holds the pitching staff together.”29At the age of 33, Passeau seemed more durable than ever although he was no longer expected to relieve ten to 15 times per year. In the first half of the season, he won a career eight straight starts (all complete games) en route to a 19-14 record accompanied by 24 complete games (in 34 starts). He redeemed himself in the All-Star Game, surrendering just one hit in two scoreless innings in the NL’s 3-1 loss. Slugging outfielder Bill Nicholson, second-year pitcher Hi Bithorn, and Passeau were among the few highlights on an underachieving Cubs squad in 1943 that had been widely expected to compete for the pennant largely because of an expected potent offense that never materialized. Passeau won 15 games, high- lighted by two early-season extra-inning affairs. On May 5 he held the St. Louis Cardinals to just one run in a 14-inning complete game at Wrigley Field to earn his first victory of the season; in his last start of the month, he hurled a 13-inning complete game and drove home Lou Novikoff with two outs in the ninth to defeat the Boston Braves, 4-3. During his playing days, Passeau was a successful farmer and business man in Lucedale, Mississippi, and was often counted among the few baseball players who did not need to play for the money. He owned a 600- acre farm on which he cultivated tung oil trees, and a John Deere farm-equipment dealership. In November 1938 he married Agnes Bernyce Spafford, with whom he had two children, Claude Jr. and Patricia. Passeau was classified 4-F because of his deformed hand, and was not required to serve in the military in World War II. The Cubs were accustomed to Passeau’s annual late arrival at spring training in order to finish planting on the farm; however, they were surprised by his unexpected announcement that he would not return to the team in 1944. But the tug of pitching and the intervention of the Cubs’ otherwise aloof owner, Philip K. Wrigley, wastoomuchforhimtoignore.“Needlesstosay,”wrote IrvingVaughanoftheChicagoDailyTribune,“[Passeau] was welcomed like a long lost uncle with a bank roll.”30 Having missed all of spring training and the first week of the season, Passeau struggled in his return, and didn’t win his first game until June 2.The 35-year-old gradually rounded into shape to win his final seven decisions in the last four weeks of the campaign en route to a 15-9 record. As the Cubs clung to a precarious lead in September and eventually secured the pennant by three games over the St. Louis Cardinals, Passeau won three con- secutive decisions, highlighted by back-to-back four-hit shutouts. Aptly nicknamed “Mr. Chips” (because of his bone chips) by “Jolly Cholly” Grimm, Passeau won 17 games, posted the second-best ERA in the NL (2.46), and led the league with five shutouts. He had an uncanny ability of avoiding the gopher ball despite pitching his home games in a home-run-friendly park, yielding just four in 227 innings. The 1945 World Series matched the Cubs and the Detroit Tigers with the first three games scheduled at Briggs Stadium in accordance with wartime travel restrictions still in effect though the war had just ended. With the Series tied at one game apiece, Passeau pitched the game of his life in front of 55,500 spectators on October 5. “I felt so good,” he said, “I began to tease the Detroit hitters, I am naturally fidgety. I noticed it annoyed them so I put it on more than ever.”32 On baseball’s biggest stage, Passeau tossed his only career one-hitter, surrendering a single to his former roommate from the Tigers farm system, Rudy York, in the second inning. Passeau also knocked in the third and final run on a deep fly ball to center field allowing catcher Mickey Livingston to score. “[Passeau displayed] good speed, sharp breaking curve ball, perfect control, and an un- ruffled demeanor, plus a slider,” wrote syndicated col- umnist Grantland Rice.33 Passeau struggled with his control in Game Six, issuing six walks and three earned runs in 62⁄3 innings before yielding to reliever Hank Wyse, yet was in line for the victory until the Cubs bullpen squandered the lead in the eighth inning of an eventual 8-7 victory in 12 innings. In the Cubs’ demoral- izing 9-3 Game Seven defeat at Wrigley Field, Passeau tossed one inning of relief, yielding the final two Tigers runs. He took the mound for the first three innings, surrendered a two-run home run to Charlie Keller, and was charged with the loss in a 12-0 thrashing. In August Passeau strained his back fielding a grounder against the Cardinals. He was eventually diagnosed with two rup- tured discs which required surgery in the offseason. The offseason back operation in February effectively ended Passeau’s big-league career. He struggled in his return to the team in late June 1947 and made just six starts among his 19 appearances. At a press conference on the eve of the Cubs’ final home series of the season, general manager James T. Gallagher signaled a decisive youth movement and an unceremonious end to an era in Cubs baseball by announcing the unconditional release of veterans Passeau, Stan Hack, Bill Lee, and Billy Jurges, each at least 37 years old.36 Passeau posted a 162-150 record accompanied by 3.32 ERA in 2,7192⁄3 innings in his 13-year big-league career. Passeau died on August 30, 2003, in Lucedale at the age of 94. He was preceded in death by Bernyce, his wife of 64 years. They are both buried at Magnolia Cemetery in their home town. 1. Rick Hines, “Claude Passeau. Ex-Cub ace recalls major league career,” Sports Collectors Digest, March 8, 1991, 200. 3. The Sporting News, January 1, 1939. 6. The Sporting News, October 10, 1945, 4. 7. Associated Press, “Today by Knight,” Charleston (West Virginia) Gazette, July 28, 1935, 1. 8. John C. Skipper, Take Me Out to the Cubs Game ( Jefferson, North Carolina: McFarland, 2000), 16. 9. United Press, “Passeau Rated ‘Wild Man’ by Scout Patsy O’Rourke,” Pittsburgh Press, August 12, 1945, 31. 10. Associated Press, “Phillies,” New York Times, March 5, 1936, 29. 11. The Sporting News, December 31, 1936, 1. 12. The Sporting News, January 14, 1937, 4. 13. Associated Press, “Wilson Counting Heavily on Pair of Former Grays,” Gazette and Bulletin (Williamsport, Pennsylvania), March 16, 1937, 8. 14. Roscoe McGowen, “Passeau Pitches Phillies to Victory Over Dodgers With Aid of Two Homers,” New York Times, July 4, 1937, C5. 15. “Passeau Delivery Stirs Inquiry,” 1939 (unknown source, in Passeau’s Hall of Fame file). 16. The Sporting News, January 19, 1939, 3. 17. “Say Passeau Uses A ‘Sweat Spitter,’ ” 1940 (unknown source, in Passeau’s Hall of Fame file). 19. Sid Feder, Associated Press, “Jimmy Foxx Threatens Runs-Batted-In Record,” The Day (New London, Connecticut), July 2, 1938, 8. 20. The Old Scout, “Phillies’ Deal Stirs Surmises,” 1939 (Unknown source, in Passeau’s Hall of Fame file). 21. Edward Burns, “Cubs Get Passeau; Trade Three to Phillies,” Chicago Daily Tribune, May 30, 1939, 21. 22. Edward Burns, “Cubs Climb Into 2d Place; Best Dodgers, 4-2,” Chicago Daily Tribune, July 19, 1939, 21. 23. The Sporting News, January 19, 1939, 3. 24. The Sporting News, September 20, 1945, 7. 26. Irving Vaughan, “Passeau Runs Into More Hard Luck — And Reds — So Cubs Lose,” Chicago Daily Tribune, June 30, 1940, A1. 27. The Sporting News, May 21, 1942, 1. 28. Dan Daniel, “Dan’s Dope,” New York World Telegram, June 1941. 29. Joe King, “Ott Candidate For Best Player Award,” New York World- Telegram, August 17, 1942 (unknown source, in Passeau’s Hall of Fame file). 30. Irving Vaughan, “Cubs Perk Up; Passeau in Fold,” Chicago Daily Tribune, April 29, 1944, 17. 31. The Sporting News, September 20, 1945. 32. The Sporting News, October 11, 1945, 1. 33. Grantland Rice, “Tigers Trek From Bench To Plate and Vice Versa In Futile Bid,” Ottawa Citizen, October 6, 1945, 10. 35. Bill James and Rob Neyer, The Neyer/James Guide to Pitchers (New York: Fireside, 2004), 337. 36. James Segreti, “Cubs Release Passeau, Hack,” Chicago Daily Tribune, September 27, 1947, 19. 37. United Press International, “Claude Passeau Now Sheriff,” Daily News (Springfield, Massachusetts), June 19, 1974, 40.